WENNER, Adrian (b. 1928), Natural History professor and entomologist retired from the University of California Santa Barbara. Wenner spent the latter part of his career eliminating historically introduced honey bees from Santa Cruz Island by introducing the varroa mite. Adrian M. Wenner, professor of Natural History and Provost of the College of Creative Studies at the University of California, Santa Barbara, retired from his university appointment Jan. 1, 1993. 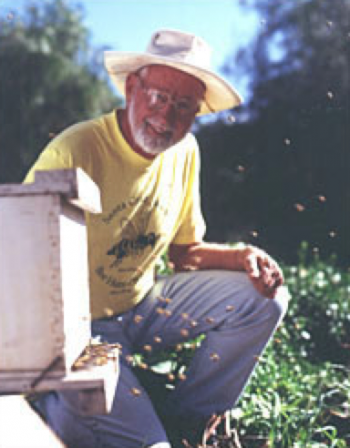 That retirement permits him to return to research on honey bees full time, with particular attention to the removal of feral (wild) bee colonies from Santa Cruz Island (e.g., American Bee Journal – December, 1990) and studies of colony foraging patterns (e.g., American Zoologist – December, 1991). Dr. Wenner, born in Roseau, MN, in 1928 is one of a long line of beekeepers. His grandfather and four uncles, as well as several brothers and cousins, kept bees during the past several decades. His first serious introduction to beekeeping occurred while he was an electronics technician in the U.S. Navy in California, at which time he visited his large scale beekeeper uncles, Clarence and Leo Wenner in the Sacramento Valley. Those visits eventually led to his apprenticeship with Clarence, the well respected queen breeder, package shipper, and migratory beekeeper of Glenn, California. Several seasons of intensive work with uncles Clarence and Leo provided valuable practical background for his later research on bees. After leaving the Navy, Dr. Wenner studied mathematics, physics, and education at Gustavus Adolphus College in St. Peter, Minnesota. He began graduate work in mathematics at Oregon State but soon began a new career in biology. After completing a master’s degree in the teaching of biological sciences at Chico State College in California, he was principal of an elementary school in Halfway, Oregon and high school algebra teacher in Fair Oaks, California. He then went on to obtain masters and Ph. D. degrees in zoology at the University of Michigan in Ann Arbor. While a beginning graduate student at Michigan, Dr. Wenner was drawn back to the study of honey bees. His background in electronics, mathematics, and physics, combined with the fact that portable tape recorders and sonagraphs had just been invented, permitted him to record and analyze the many different sounds produced by bees within their colony (e.g., Scientific American, April, 1964). Among other sounds he was the first to discover a peculiar pulsed sound made by bees during their waggle dances. That discovery, in turn, led to his dissertation research at Michigan – under the prevailing premise that this waggle dance constituted a “language,” as hypothesized by Karl von Frisch 10 years earlier. Upon completing graduate school, Dr. Wenner began teaching at the University of California in Santa Barbara and continued his research on communication in honey bees. While doing so, he eventually recognized serious discrepancies about assumptions basic to the honey bee dance language hypothesis. By repeating von Frisch’s original experiments with additional controls incorporated into those experiments, he and his co-workers obtained results at variance with results others had obtained when they ran such experiments with lesser controls. After publishing the results in scientific journals, reaction of the bee research community became so adverse that it was no longer possible to either publish in refereed journals or to reply in print to those who challenged the work of his colleagues and himself. Although hostility had been anticipated, the degree of isolation was surprising; consequently, Dr. Wenner turned to studies in marine biology for more than two decades. That “leave of absence” provided time for the intellectual climate to change, a change that has permitted him to return to bee research (e.g., American Bee Journal, February, 1987). During the leave of absence, he joined forces with Patrick H. Wells in a study of the philosophy and sociology of science. That background provided them with knowledge that allowed them to clarify how their experiences in the dance language controversy could be related to the question of how science actually works – as against popular and scientific perceptions of that process. They published their book, Anatomy of a Controversy: The Question of a “Language” Among Bees, with Columbia University Press in 1990. Favorable comment by diverse reviewers suggests that the arguments presented therein merit wide dissemination and discussions. In the 20 year hiatus between bouts of bee research, Dr. Wenner studied the biology of monarch butterflies, island biogeography, and growth and reproduction of crustaceans. In the latter case, he made major contributions in studies involving the biomonitoring of coastlines and helped organize a new society and start a new journal in crustacean biology. He also edited or co-edited three volumes on crustacean growth and reproduction, the only such volumes devoted to those topics. Dr. Wenner returned to bee research six years ago, with a conservation-restoration project on Santa Cruz Island in the newly formed Channel Islands National Park. An amateur beekeeper introduced honey bees (perhaps a pure Dark European or “German” strain) to that island more than 110 years ago, at which time they became feral and spread over nearly the entire island. That long period of isolation provides an unexcelled opportunity to study colony foraging patterns in the manner begun by Dr. John Eckert (formerly of the UC Davis campus) in the late 1920s. Since the large (96 sq. mi or 25,000 hectare) island is essentially uninhabited, foraging studies can be conducted without human interference. Insight gained in the Santa Cruz Island beehunt project should also be valuable to those who will need to cope with the Africanized bee invasion. Among relevant contributions published so far, one on locating feral bee colonies (Bee Science – June, 1992) ranks the effectiveness of earlier beehunting techniques and describes new and more efficient methods. Adrian Wenner, Professor Emeritus (Natural History) at the University of California, Santa Barbara, still continues research and writing on the subject of bee biology, as well as several other topics. He began his career with a 1940s stint as an electronics technician in the U.S. Navy. While completing a mathematics degree in college, he worked several years with honey bees under the mentorship of his commercial beekeeping uncles, Clarence and Leo Wenner. Adrian completed a new major in biology at Chico State University and went on to the University of Michigan for his doctorate. While there he was the first to discover the sounds made by bees during their waggle dance and pursued that lead for his dissertation. During later research, while teaching at the University of California in Santa Barbara, he and co-workers obtained experimental evidence sharply at variance with expectations of the dance language hypothesis. They eventually gained sufficient experimental evidence to conclude that a 1937 von Frisch hypothesis (that searching bees rely solely on odor and not on some sort of “language”) could better explain honey bee recruitment to food crops – as well as the means by which swarms move. Unfortunately, the publication of the experimental results that countered the dance language hypothesis generated intense hostility in the scientific community. The adverse reaction of the bee research community made it no longer possible for them to either publish in journals or to reply in print to those who challenged their work. Adrian then spent two decades in marine biological research while waiting for tempers to cool. During that time he and Patrick Wells studied the philosophy and sociology of science and published Anatomy of a Controversy: The Question of a “Language” Among Bees (Columbia University Press, 1990). That book documented the fact that resistance to their research rested not as much on evidence as on the training and attitude of scientists. The notion of an odor-search hypothesis (as originally postulated by von Frisch) now has a broad following in the wider scientific community. Honey Bees: Do They Use the Direction Information Contained in Their Dance Maneuver? Honey Bees: Do They Use the Distance Information Contained in Their Dance Maneuver? Do Honey Bees have a Language? Recruitment to Food: Tangible Odor-Search or Mystical Language? Why Not Give All the Facts? Science as a Process: the Question of Bee Language"
Is the Touted "Language" of Honey Bees Real? Do Honey Bees Still Have a "Dance Language?" Does Honey Bee Nasanov Pheromone Attract Foragers? Did Radar Tracking of Bee Flight Paths Resolve the Bee Language Controversy? Resolving a Controversy or Shoring up a Belief System? Bee Controversy Breakthroughs: Odor-Search vs. "Language"
Colony Survival: A Better Bee or a Milder Mite? This page was last edited on 17 April 2019, at 15:30.